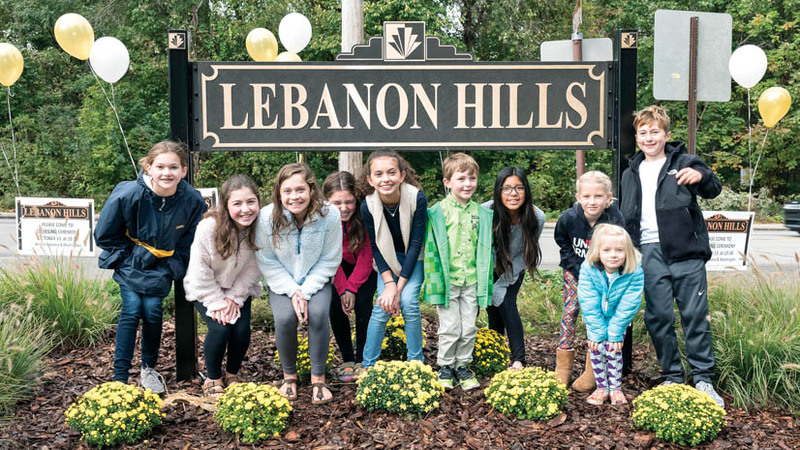 Lebanon Hills residents paid for the design, installation and maintenance of a sign that marks the entrance to their historic neighborhood. Mt. Lebanon’s revised neighborhood identification sign policy outlines the requirements that must be met if residents would like a sign for their neighborhood. NEIGHBORHOOD SIGNS Residents of Lebanon Hills have unveiled a new neighborhood entry sign at the corner of Park Entrance Drive and Washington Road. The sign is the first to be designed and installed under Mt. Lebanon’s revised neighborhood identification sign policy. The process began nearly two years ago, when Lebanon Hills residents approached the historic preservation board with their idea for a distinctive sign they felt would distinguish their historic neighborhood. To facilitate the policy, Assistant Manager/Planner Ian McMeans, worked with municipal staff to define the boundaries of every Mt. Lebanon subdivision. so only the people living in a neighborhood would ever be asked to approve or contribute to the cost of a sign. GIS Coordinator Michael Meseck developed a map that delineates the boundaries of neighborhoods. Neighborhoods must obtain approval from the commission to erect a sign, after meeting the criteria in the sign policy. They must begin by submitting a petition showing that a simple majority of neighborhood residents want the sign. They also must take responsibility for the cost of fabrication, installation and maintenance of the sign. Once the commission gives its approval, the sign must meet a number of standards, covering details such as design, material, size and placement. SCHOOLS ENHANCE SECURITY In just about every school shooting, if you start from the beginning, you can find safety protocols that failed. It could be a school resource officer who didn’t “go in” when he should have, a piece of infrastructure such as a fence that didn’t keep out a shooter or a person who did not get proper treatment through the mental health system. The truth is, any part of a good protection plan can fail in an emergency. That’s why Mt. Lebanon Police Chief Aaron Lauth believes in what he calls “layers and redundancies”—many different protections that surround our children both physically and systemically, so that if anything or anyone fails, another protection is there to back it up. It’s under that guideline that Mt. Lebanon School District aims to keep students safer by making $1 million in upgrades to its buildings. At a school/community meeting in October, Superintendent Timothy Steinhauer detailed the main improvements: more cameras in school buildings; better communication, such as more walkie talkies; more public address speakers (such as in stairwells) and signage. Every door and classroom is now numbered so someone in danger can report a specific position to police. 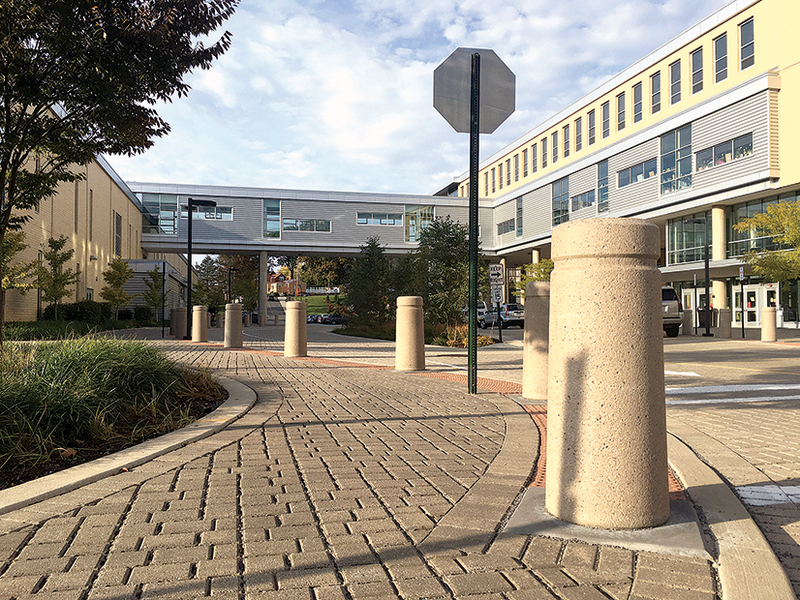 Among the upgrades that will improve physical protection are such things as clear laminates applied to windows that make it harder to shatter the glass and break into the school, and bollards—or rigid pillars—that keep someone from driving a vehicle into crowds or into the building. Those items help delay someone from doing harm. “A delay gives us more time to be notified and get there and to neutralize the threat,” Lauth says. Steinhauer and Lauth also reviewed the programs and practices already in place, such as active shooter drills in the “ALiCE” format. ALiCE, a school-modified version of the “Run Hide Fight” tactic, has several components. The letters stand for alert, lockdown, inform, counter and evacuate, but it’s not a checklist and it’s not something to be done necessarily in that order. It is a set of options that teachers, staff and students can employ when confronted with a threat. It involves everyone “making themselves a hard target,” Lauth said, meaning taking action to protect themselves rather than sitting still or hiding. Most school shooter situations end in five minutes. “Our response time is two to four minutes,” Lauth said. Once the danger is neutralized, first responders must continue to act to save lives, whether it’s stopping bleeding or getting people to hospitals. That post-shooter activity was the focus of an active drill at the high school this summer. Steinhauer explained programs are already in place in all grades to bolster mental health, from anti-bullying programs to “Tuesday Talks” in the middle schools, to mindfulness seminars for teachers and students. “Caring schools are safer schools,” he said. They also discussed the StudentProtect app, which 9,000 Mt. Lebanon people have downloaded since it was introduced this year. The app, geared toward parents and students, allows for anonymous reporting of potential threats. Since it launched, the district and police have received 194 alerts; 15 percent required an investigation. Steinhauer and Lauth said they avoided adding any tactic or protection that has not been proven effective. “I want to look more at the evidence-based actions,” Lauth said. FANTASTIC FINANCIAL REPORTING Mt. Lebanon earned a Certificate of Achievement for Excellence in Financial Reporting from the Government Finance Officers Association of the United States and Canada for excellence in the 2017 comprehensive annual financial report (CAFR). The certificate, which Mt. Lebanon has earned every year since 1976, is the highest form of recognition in governmental accounting and financial reporting. Finance director Andrew McCreery and assistant finance director Terri Windstein are responsible for preparing the CAFR. The GFOA says Mt. Lebanon’s report demonstrates a “constructive spirit of full disclosure to clearly communicate its financial story,” and the finance department motivates residents to read the report. It is available online. NEW RECYCLING REGS Mt. Lebanon’s new five-year, $11 million trash and recycling contract with Waste Management, will begin in January. Trash will continue to be picked up weekly; recycling pickup will continue to be bi-weekly. In January, there will be big changes in what we can recycle. No glass may be recycled, and only hard plastics #1 and 2 may be recycled. Pliable plastics #3-7 must go into your regular trash. 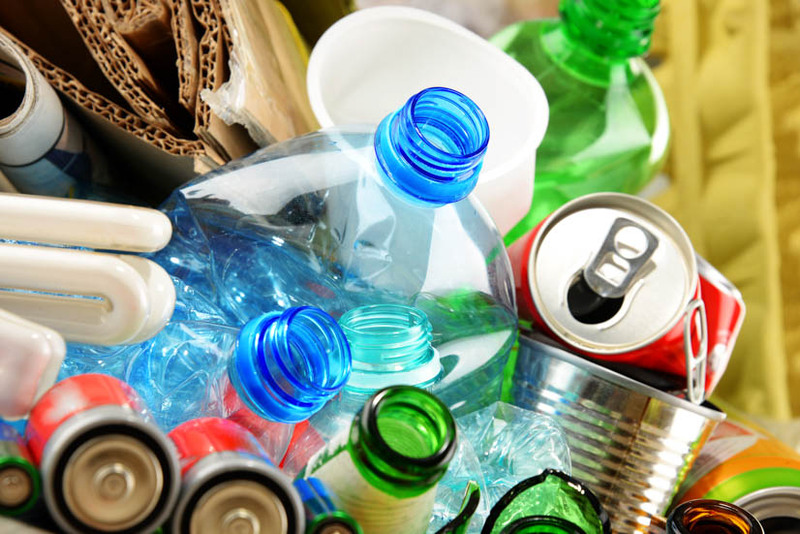 This change is dictated by the volatile global recycling market. None of the three waste haulers who submitted bids to the South Hills Council of Governments were willing to accept glass or any other plastics beyond # 1 or 2. There no longer is a market for most plastics, and although there still is a market for glass, recycling glass is expensive and shattered glass is the main contaminant that causes loads of recycling to be rejected at the recycling plant or even at the Pacific Rim, where most of our recycling goes, meaning the loads end up in a landfill. 2019 will be an “educational year,” Beginning in 2020, Mt. Lebanon and other communities will be penalized $150 per contaminated load, a possible burden to taxpayers of more than $250,000 a year. Paper, cardboard and metal are still allowed. For more information, see FAQs. TRANSIT TALK More than 1,100 municipal planners, transportation experts, development officers and others interested in modern urban transportation came to Pittsburgh for Railvolution 2018 in October. As part of the program, a breakout session of attendees rode the LRT from downtown to Mt. Lebanon, and stopped here for a “lunch and learn” with Andrea Elcock from the Port Authority and Eric Milliron, Mt. Lebanon’s commercial districts manager. Conversation focused on transit oriented development (TOD), improving accessiblity of light rail stations and design improvement for stations and stops. The group also discussed the topics of gentrification, affordable housing and displacement of residents for transit development, none of which are controversial issues in Mt. Lebanon but can be hot button points for other Pittsburgh neighborhoods. Other towns on the tour included Dormont and Beechview. RESIDENTS ACADEMY The Mt. Lebanon Community Relations Board and Mt. Lebanon Public Information Office will present the second Mt. Lebanon Residents Academy beginning Thursday, January 10, from 6:30 to 8:30 p.m. with eight two-hour sessions lasting through the first Thursday in March (with a break for Valentine’s Day). The first session is at the municipal building, but there are sessions at the library, rec center, public safety center and high school. This is a great way to learn about how municipal and school services are delivered—and it’s free. Last year’s class of 30 included new and longtime residents and men and women from their 20s through their 70s representing a variety of backgrounds and interests. WINTER IS COMING Just a friendly reminder: An accumulation of snow or ice of one inch or more must be removed from public walkways within 24 hours of the end of the snowfall. This holds true for houses, apartments and even vacant buildings. 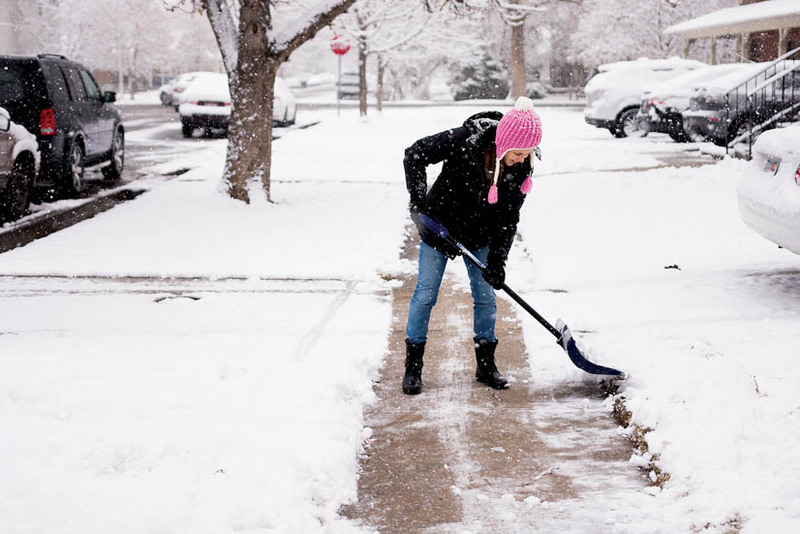 Business owners must clear their sidewalks within four hours of accumulation between 7 a.m. and 10 p.m., Mondays through Saturdays. In addition, in the 24-hour period after a snowfall of one inch or more, there is no on-street parking between 9 p.m. and 6 a.m. to allow snowplows the room they need to clear streets. We hate to talk about fines, but they exist, and you don’t want them. Violators of the ordinance can expect to pay anywhere from $5 to $1,000 based on how many offenses they have accrued (and each day you are in violation can count as a separate offense). If you can’t shovel your walk and can’t afford to hire someone to help you, the high school Chore Corps may be able to provide a volunteer, if one is available from your neighborhood. Don’t wait until it snows. Call the High School Community Service Coordinator at (412) 344-2114.